We recently confirmed that angiotensin II (Ang II) type 1 receptor (AT1R) was overexpressed in hepatocellular carcinoma tissue using a murine hepatoma model. Angiotensin(Ang)-(1-7) has been found beneficial in ameliorating lung cancer and prostate cancer. Which receptor of Ang-(1-7) is activated to mediate its effects is much speculated. This study was designed to investigate the effects of Ang-(1-7) on hepatocellular carcinoma, as well as the probable mechanisms. H22 hepatoma-bearing mice were randomly divided into five groups for treatment: mock group, low-dose Ang-(1-7), high-dose Ang-(1-7), high-dose Ang-(1-7) + A779 and high-dose Ang-(1-7) + PD123319. Ang-(1-7) treatment inhibited tumor growth time- and dose-dependently by arresting tumor proliferation and promoting tumor apoptosis as well as inhibiting tumor angiogenesis. 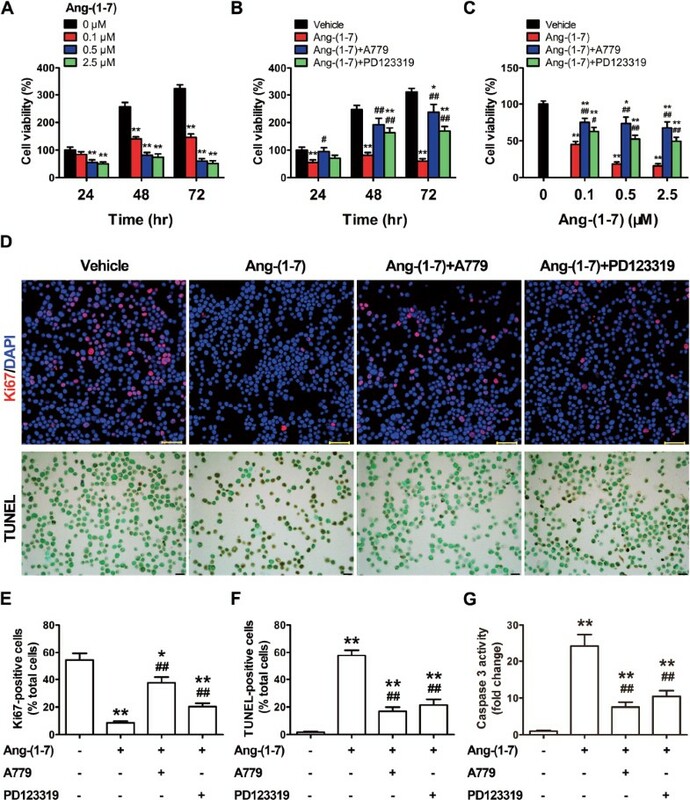 The effects of Ang-(1-7) on tumor proliferation and apoptosis were reversed by coadministration with A779 or PD123319, whereas the effects on tumor angiogenesis were completely reversed by A779 but not by PD123319. 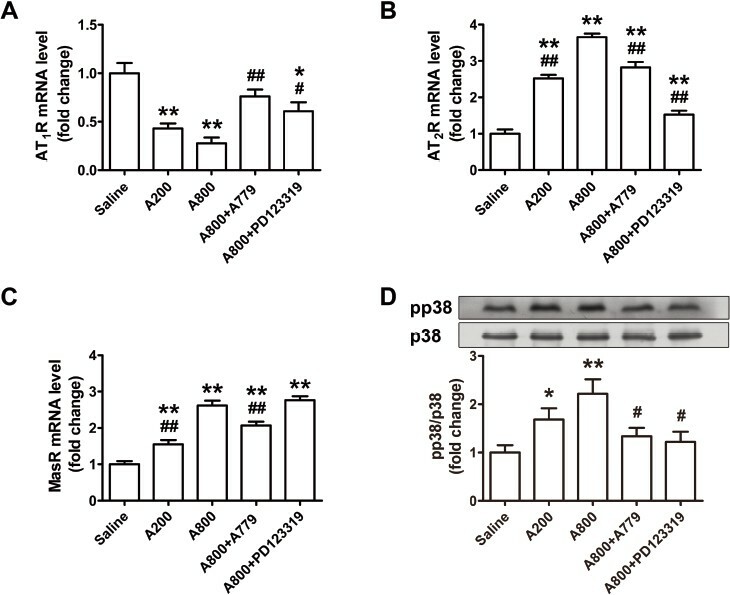 Moreover, Ang-(1-7) downregulated AT1R mRNA, upregulated mRNA levels of Ang II type 2 receptor (AT2R) and Mas receptor (MasR) and p38-MAPK phosphorylation and suppressed H22 cell-endothelial cell communication. Thus, Ang-(1-7) administration suppresses hepatocellular carcinoma via complex interactions of AT1R, AT2R and MasR and may provide a novel and promising approach for the treatment of hepatocellular carcinoma. A functional renin-angiotensin system (RAS) has been identified in a variety of tumors, including breast cancer, cervical cancer, prostate cancer, pancreatic carcinoma and colon cancer (1). A wealth of evidence indicates that RAS plays an important role in the pathogenesis of cancer, and angiotensin-converting enzyme (ACE), angiotensin I (Ang I), angiotensin II (Ang II), angiotensin-converting enzyme 2 (ACE2) and angiotensin (Ang)-(1-7) are recognized as important components of RAS (2). Ang II mediates biological effects by activating two distinct G protein-coupled receptors, the Ang II type 1 receptor (AT1R) and Ang II type 2 receptor (AT2R). RAS is a potential chemotherapeutic target for cancer because Ang II, though activation of AT1R, regulates cell proliferation and migration, angiogenesis, inflammation and extracellular matrix formation. ACE inhibitors and AT1R blockers are efficacious in reducing and/or delaying tumor growth (3). Ang-(1-7), a heptapeptide converted from Ang I by ACE and endopeptidases (including prolyl oligopeptidase, neprilysin and thimet oligopeptidase) and from Ang II by ACE2, binds to a distinct plasma membrane G protein-coupled receptor, the Mas receptor (MasR) and exerts both vasodilator and antiproliferative effects (2). Treatment of patients or animals with ACE inhibitors results in a significant elevation of the circulating and tissue levels of Ang-(1-7) (4); thus, the antitumor effects of ACE inhibitors may be due in part to the antiproliferative actions of the heptapeptide. Although the literature supports a beneficial role for Ang-(1-7) in lung cancer and prostate cancer (5,6), the effects of Ang-(1-7) on other tumors have not been evaluated. We recently confirmed that AT1R was overexpressed in hepatocellular carcinoma tissue using a murine H22 hepatoma model (7). Which receptor of Ang-(1-7) is activated to mediate its effects is much speculated. The goal of this study was to determine whether Ang-(1-7) reduced the growth and angiogenesis of hepatocellular carcinoma and its probable mechanisms. Male BALB/c mice (6–8 wks old) were purchased from Shandong University Animal Center and were maintained under pathogen-free conditions. The BALB/c mice were injected with 1 × 107 H22 cells in 0.1 mL phosphate buffered saline (PBS) into the right upper back to establish the hepatoma model. Day 7 after H22 cell inoculation, the mice were randomly divided into five groups (12 per group) for treatment: mock group, low-dose (200 ng · kg−1 · min−1) Ang-(1-7) (Auspep), high-dose (800 ng · kg−1 · min−1) Ang-(1-7), high-dose Ang-(1-7) + A779 (a MasR antagonist, 800 ng · kg−1 · min−1) (Auspep) and high-dose Ang-(1-7) + PD123319 (an AT2R antagonist, 10 mg · kg−1 · day−1) (Pfizer). Ang-(1-7), A779 and PD123319 were infused subcutaneously by use of an implanted Alzet osmotic pump (Alza Corp). The mice in the mock group received an equal volume of saline as the other groups by subcutaneous infusion via osmotic minipumps. Tumor volumes were measured by caliper every week and calculated with the formula for a semiellipsoid: (4/3πγ3)/2. The tumor burden of each mouse was weighed. On d 21 of the infusion, the mice were anesthetized with halothane and killed by cervical dislocation. The animal protocol was reviewed and approved by the Institutional Animal Care and Use Committee at Qilu Hospital, Shandong University. Murine hepatocellular carcinoma cell line H22 (Cell Bank of Chinese Academy of Sciences) was cultured in RPMI 1640 medium (Invitrogen) and murine liver sinusoidal endothelial cells (LSECs) (Cell Biologics) were cultured in endothelial cell medium (ScienCell), all supplemented with 100 units/mL penicillin, 100 units/mL streptomycin and 10% fetal bovine serum (all Gibco BRL) at 37°C in a 95% air/5% CO2 humidified atmosphere. Tumors were fixed in phosphate-buffered 4% paraformaldehyde, embedded in paraffin and cut into 4-µm thick sections. Cell proliferation in tumor tissue sections and cultured H22 cells was detected by immunofluorescence staining with an antibody to Ki67 (Abcam). Immunoreactive cells were expressed as a proportion of total cell counts. Endothelial cells were highlighted by immunofluorescence staining with an antibody to CD34 (Abcam). Blood vessels were visualized by the presence of CD34− positive endothelial cells and identified by morphology. Apoptotic cells in tissues and cultured cells were quantified by terminal deoxynucleotidyl transferase-mediated dUTP nick-end labeling (TUNEL) with a commercial kit (Millipore) according to the supplier’s protocol. Each section was deparaffinized and rehydrated with serial changes of xylene and ethanol. Proteinase K (20 mg/L) was applied to sections for 15 min for optimal proteolysis. Endogenous peroxidase activity was inhibited with 3% H2O2 for 5 min. The TdT reaction was carried out for 1 h at 37°C in a humidified chamber, then DAB chromogen was applied. Tissue was counter-stained with methyl green. TUNEL-positive cells were determined by randomly counting 20 fields in the section and data were expressed as a percentage of normal nuclei. Fresh tissues and cell pellets were homogenized separately as described previously (8). The homogenate was centrifuged at 20,000g for 30 min. Caspase 3 activity was assessed in supernatants by following the proteolytic cleavage of the colorimetric substrate Ac-DEVD-ρNA. Cleavage of the substrate was monitored at 405 nm using a microplate spectrophotometer. Listed in Table 1 are primer sequences for real-time RT-PCR of mouse AT1R, AT2R, MasR, vascular endothelial growth factor A (VEGF-A) and the housekeeping gene glyceraldehyde 3-phosphate dehydrogenase (GAPDH). Total RNA was extracted from freshly isolated myocardial samples by use of TRIzol reagent (Invitrogen). Oligo (dT) primed cDNA synthesis involved use of reverse transcriptase (Invitrogen). Transcripts were amplified from reverse-transcribed cDNA by use of SYBR Green (Invitrogen). Quantitative assessment of relative gene expression levels involved the 2−ΔΔCT method. Primer sequences for real-time RT-PCR. AT1R, angiotensin II type 1 receptor; AT2R, angiotensin II type 2 receptor; MasR, Mas receptor; VEGF-A, vascular endothelial growth factor A.
Solubilization of tumors tissues or isolated cells, SDS-PAGE and Western blot analysis were performed as described (9). Membranes were incubated with primary antibodies against VEGF-A (Abcam), total p38-MAPK (Cell Signaling Technology), phospho-p38 (pp38) (Cell Signaling Technology) and β-actin (Cell Signaling Technology), followed by appropriate horseradish peroxidase-labeled secondary antibodies. Protein levels were normalized to that of β-actin as an internal control. Cell viability was evaluated with the MTT method. In brief, cells treated with or without Ang-(1-7) or other agents were seeded into 96-well plates (1.5 × 104 cells/well) and incubated at 37°C and 5% CO2. After exposure for 24, 48 or 72 h, the number of viable cells was determined by MTT as described (10). In total, 150 µL Matrigel (nongrowth factor-reduced, 8–10 µg/µL) (BD Biosciences) was added to each well of a 48-well plate and allowed to solidify at 37°C for 1 h. LSECs (1 × 105) resuspended in 200 µL medium were seeded onto the Matrigel and monitored over time for the formation of tube-like structures. After 1-h culture, LSECs were treated with vehicle, Ang-(1-7) or VEGF-A for 12 h. For conditioned medium experiments, endothelial cell medium was replaced with tumor-conditioned medium after 1 h of culture. H22 cells were treated with vehicle, Ang-(1-7), Ang-(1-7) + A779 or Ang-(1-7) + PD123319 for 48 h, medium was removed, minimum amounts of serum-free medium were added to cover the cells and cells were incubated for 24 h. Tumor-conditioned medium was collected and added into 48-well plates, which were coated with Matrigel and seeded with LSECs. After an additional 12 h culture, tube length was quantified by use of IP Lab 4.0 image-analysis software. SPSS v11.5 (SPSS Inc.) was used for statistical analysis. Continuous data are expressed as mean ± SE mol/L and were compared by one-way analysis of variance (ANOVA), followed by Tukey-Kramer post-hoc test and independent-samples t test. P < 0.05 was considered statistically significant. The tumors of saline-treated mice increased in size over time, whereas the growth was dose-dependently reduced by Ang-(1-7) (Figure 1A). No changes in body weight or pathological abnormalities were observed. At the end of the study, the mice were euthanized and the tumors were removed and weighed. The tumors from mice treated with 800 ng · kg−1 · min−1 Ang-(1-7) weighed ∼76% less than the tumors of mice infused with saline (Figures 1B, C), so Ang-(1-7) reduced tumor growth. However, the salutary effects of Ang-(1-7) on tumor growth were largely offset by A779 or PD123319. No gross pathologic abnormalities were observed in major organs after death, which indicated a lack of toxic side effects at the Ang-(1-7) dose given. Ang-(1-7) treatment inhibits growth of murine hepatocellular carcinoma in vivo. (A) Quantitative analysis of the time response of tumor volume after different treatments. *P < 0.05 versus the saline group; #P < 0.05 versus the A800 group. (B) Top panel: Representative tumor size in five groups of mice. Mid panel: The cell proliferation of hepatocellular carcinoma tissues displayed by Ki67 staining (red: nuclei) and DAPI counterstaining (blue: nuclei) (scale bar: 50 µm). Bottom panel: The cell apoptosis of hepatocellular carcinoma tissues displayed by TUNEL staining (brown: nuclei) and methyl green counterstaining (green: nuclei) (scale bar: 20 µm). (C) Quantitative analysis of tumor weight in five groups of mice. **P < 0.01 versus the saline group; #P < 0.05 and ##P < 0.01 versus the A800 group. (D) Quantification of Ki67-positive cells. **P < 0.01 versus the saline group; ##P < 0.01 versus the A800 group. (E) Quantification of TUNEL-positive cells. (F) Quantification of caspase 3 activity. *P < 0.05 and **P < 0.01 versus the saline group; ##P < 0.01 versus the A800 group. A200, low-dose Ang-(1-7) (200 ng · kg−1 · min−1); A800, high-dose Ang-(1-7) (800 ng · kg−1 · min−1). Ang-(1-7) treatment dose-dependently reduced the proportions of proliferating cells in tumors as compared with the saline group, and the effect was reversed completely by A779 and partially by PD123319 (Figures 1B, D). Moreover, Ang-(1-7) treatment dose-dependently increased the proportions of apoptotic cells and caspase 3 activity in tumors, and the effects were reversed by coadministration with A779 or PD123319 (Figures 1B, E, F). Tumor tissue sections from saline-treated animals showed numerous blood vessels as compared with sections from Ang-(1-7)-treated animals (Figure 2A). Injection of 800 ng · kg−1 · min−1 Ang-(1-7) caused an ∼82% reduction in intratumoral vessel density as compared with sections from saline-treated animals (Figure 2B), which suggests that the heptapeptide reduces angiogenesis to inhibit hepatocellular carcinoma growth. Moreover, Ang(1-7) treatment dose-dependently decreased mRNA and protein expression of VEGF-A, the primary proangiogenic factor released from cancer cells to stimulate the growth of new blood vessels from preexisting vessels (Figures 2C, D). The effect of Ang-(1-7) on tumor angiogenesis was completely reversed by A779 but not by PD123319. Ang-(1-7) treatment inhibits angiogenesis of murine hepatocellular carcinoma in vivo. (A) The angiogenesis of hepatocellular carcinoma tissues displayed by CD34 staining (red: vessels) and DAPI counterstaining (blue: nuclei) (scale bar: 50 µm). (B) Quantification of vessel density. *P < 0.05 and **P < 0.01 versus the saline group; ##P < 0.01 versus the A800 group. (C) Relative mRNA expression of VEGF-A. **P < 0.01 versus the saline group; #P < 0.05 and ##P < 0.01 versus the A800 group. (D) Representative Western blot analysis of protein expression levels of VEGF-A in five groups of mice and quantification of VEGF-A expression. *P< 0.05 and **P < 0.01 versus the saline group; ##P < 0.01 versus the A800 group. VEGF-A, vascular endothelial growth factor A. Commercially available antibodies against AT1R, AT2R and MasR were nonspecific (11, 12, 13). Therefore, we measured the expression of AT1R, AT2R and MasR at the mRNA level. The in vivo experiment revealed that the mRNA expression of AT1R was dose-dependently decreased (Figure 3A), whereas that of AT2R and MasR and p38 phosphorylation were increased (Figures 3B–D) with Ang-(1-7) treatment as compared with the saline group. The effect of Ang-(1-7) on mRNA levels of AT1R and AT2R was blocked in part by coadministration of A779 or PD123319, that on MasR mRNA expression was partially reversed by A779 but not PD123319 and that on p38 phosphorylation was completely reversed by A779 or PD123319. Ang-(1-7) downregulates AT1R mRNA and upregulates mRNA levels of AT2R and MasR and p38-MAPK phosphorylation in vivo. (A–C) Relative mRNA expression of AT1R (A), AT2R (B) and MasR (C) in five groups of mice. *P < 0.05 and **P < 0.01 versus the saline group; #P < 0.05 and ##P < 0.01 versus the A800 group. (D) Western blot analysis of p38 phosphorylation in five groups of mice. *P < 0.05 and **P < 0.01 versus the saline group; #P < 0.05 versus the A800 group. A200, low-dose Ang-(1-7) (200 ng · kg−1 · min−1); A800, high-dose Ang-(1-7) (800 ng · kg−1 · min−1), AT1R, Ang-II type 1 receptor; AT2R, Ang-II type 2 receptor; MasR, Mas receptor. MTT assay was used to measure cell viability. The results shown in Figures 4A–C suggested that exogenous Ang-(1-7) could time- and dose-dependently inhibit H22 cell viability, and the beneficial effects were partially blunted by coadministration of A779 or PD123319. An amount of 0.5 µmol/L Ang-(1-7) significantly decreased H22 cell proliferation (Figures 4D, E) and increased its apoptosis rate and caspase 3 activity (Figures 4D, F, G) over 72 h culture versus vehicle treatment alone, which were also abrogated by cotreatment with A779 or PD123319. 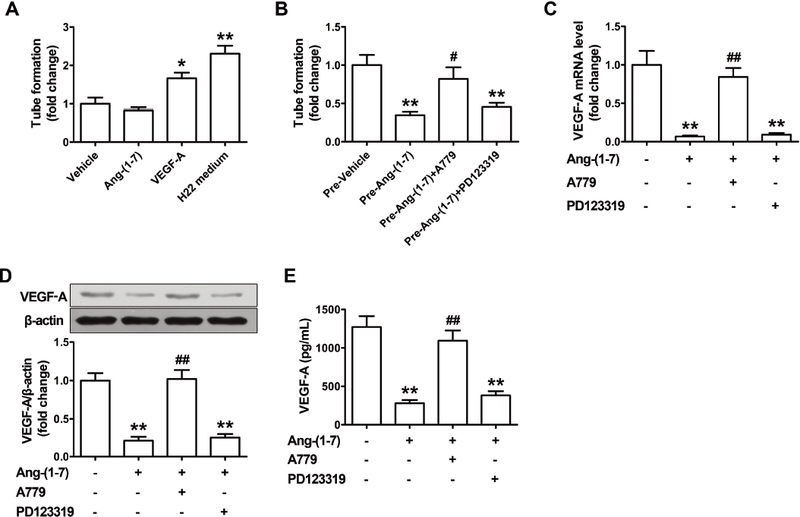 Effects of Ang-(1-7) on proliferation and apoptosis of H22 cells in vitro. (A) Quantitative analysis of the time response of relative cell viability after treatment with different doses of Ang-(1-7). **P < 0.01 versus 0 µmol/L Ang-(1-7). (B) Quantitative analysis of the time response of relative cell viability after treatment with vehicle, Ang-(1-7) alone, Ang-(1-7) + A779 and Ang-(1-7) + PD123319, respectively. *P < 0.05 and **P < 0.01 versus vehicle; #P < 0.05 and ##P < 0.01 versus Ang-(1-7). (C) Quantitative analysis of the dose-response of relative cell viability after treatment with vehicle, Ang-(1-7) alone at 3 doses, Ang-(1-7) + A779 and Ang-(1-7) + PD123319, respectively. *P < 0.05 and **P < 0.01 versus vehicle; #P < 0.05 and ##P < 0.01 versus Ang-(1-7). (D) Top panel: The proliferation of H22 cells displayed by Ki67 staining (red: nuclei) and DAPI counterstaining (blue: nuclei) (scale bar: 50 µm). Bottom panel: The apoptosis of H22 cells displayed by TUNEL staining (brown: nuclei) and Methyl Green counterstaining (green: nuclei) (scale bar: 20 µm). (E) Quantification of Ki67-positive cells. *P < 0.05 and **P < 0.01 versus vehicle; ##P < 0.01 versus Ang-(1-7). (F) Quantification of TUNEL-positive cells. **P < 0.01 versus vehicle; ##P < 0.01 versus Ang-(1-7). (G) Quantification of caspase 3 activity. **P < 0.01 versus vehicle; ##P < 0.01 versus Ang-(1-7). Following the finding of this inhibitory effect of Ang-(1-7) on in vivo angiogenesis, we performed an in vitro angiogenesis test by examining the matrix-induced tube formation of LSECs. Somewhat to our surprise, treatment with 0.5 µmol/L Ang-(1-7) failed to significantly inhibit the gel-induced tube formation of LSECs. Moreover, stimulation with H22 medium or VEGF-A significantly promoted tube formation (Figure 5A). These results indicate that the antiangiogenic effect of Ang-(1-7) observed in vivo cannot be attributed to its direct effect on endothelial cells. Effect of Ang-(1-7) on H22 cell-endothelial cell communication in vitro. (A) Relative tube formation of LSECs after treatment with vehicle, Ang-(1-7), VEGF-A and H22 medium, respectively. *P < 0.05 and **P < 0.01 versus vehicle. (B) Relative tube formation of LSECs incubated with the conditioned media of Ang-(1-7)-nontreated H22 cells (pre-Vehicle), LSECs incubated with the conditioned media of Ang-(1-7)-treated H22 cells (pre-Ang-(1-7)), LSECs incubated with the conditioned media of Ang-(1-7) plus A779-treated H22 cells (pre-Ang-(1-7) + A779), and LSECs incubated with the conditioned media of Ang-(1-7) plus PD123319-treated H22 cells (pre-Ang-(1-7) + PD123319). **P < 0.01 versus the pre-Vehicle group; #P < 0.05 versus the pre-Ang-(1-7) group. (C) Relative mRNA expression of VEGF-A in H22 cells after different treatments. **P < 0.01 versus vehicle; ##P < 0.01 versus Ang-(1-7). (D) Representative Western blot analysis of protein expression levels of VEGF-A in H22 cells after different treatments and quantification of VEGF-A expression. **P < 0.01 versus vehicle; ##P < 0.01 versus Ang-(1-7). (E) Quantitative analysis of VEGF-A levels in cultured media of H22 cells after different treatments. **P < 0.01 versus vehicle; ##P < 0.01 versus Ang-(1-7). LSECs, murine liver sinusoidal endothelial cells. Recognizing that Ang-(1-7) inhibited angiogenesis in vivo but not in endothelial cells in vitro, we considered that Ang-(1-7) stimulation might inhibit tumor cells to secrete factors promoting angiogenesis in endothelial cells (H22 cell-endothelial cell communication). To test this hypothesis, H22 cells were treated with Ang-(1-7) in vitro. The conditioned medium from Ang-(1-7)-treated H22 cells was then administered to cultured LSECs for 48 h. Treatment with conditioned medium significantly inhibited LSEC tube formation (Figure 5B), which suggests that Ang-(1-7) invokes an antiangiogenic response by inhibiting H22 cell-secreted paracrine factors. Furthermore, Ang-(1-7) downregulated mRNA and protein levels of VEGF-A in cultured H22 cells (Figures 5C, D) and VEGF-A level in its cultured media (Figure 5E). Additionally, blocking MasR with A779 completely abolished Ang-(1-7)-induced VEGF-A downregulation and reversed LSEC tube formation inhibited by the conditioned medium. Consistent with the in vivo results, mRNA expression of AT1R in cultured H22 cells was significantly decreased (Figure 6A), whereas that of AT2R and MasR and p38 phosphorylation were increased (Figures 6B–D) by Ang-(1-7) treatment as compared with the vehicle group. The effect of Ang-(1-7) on mRNA levels of AT1R and AT2R was blocked in part by coadministration of A779 or PD123319, that on MasR mRNA expression was partially reversed by A779 but not by PD123319 and that on p38 phosphorylation was completely reversed by A779 or PD123319. Ang-(1-7) downregulates AT1R mRNA and upregulates mRNA levels of AT2R and MasR and p38-MAPK phosphorylation in cultured H22 cells. (A–C) Relative mRNA expression of AT1R (A), AT2R (B) and MasR (C) after treatment with vehicle, Ang-(1-7) alone, Ang-(1-7) + A779 and Ang-(1-7) + PD123319, respectively. *P < 0.05 and **P < 0.01 versus vehicle; #P < 0.05 and ##P < 0.01 versus Ang-(1-7). (D) Western blot analysis of p38 phosphorylation after treatment with vehicle, Ang-(1-7) alone, Ang-(1-7) + A779 and Ang-(1-7) + PD123319, respectively. **P < 0.01 versus vehicle; ##P < 0.01 versus Ang-(1-7). The present study clarified the efficacy of Ang-(1-7) in H22 hepatocellular carcinoma. Administration of Ang-(1-7) inhibited tumor growth time- and dose-dependently by arresting tumor proliferation and promoting tumor apoptosis as well as inhibiting tumor angiogenesis. The mechanisms involved the downregulation of AT1R expression and upregulation of AT2R and MasR expression as well as suppression of H22 cell-endothelial cell communication. The effect of Ang-(1-7) is mainly mediated by MasR but also by AT2R. The Ang-(1-7)-MasR and Ang II-AT2R axes antagonize the effects of the Ang II-AT1R axis, especially under pathological conditions (14). The effect of Ang-(1-7) on tumor proliferation and apoptosis was reversed by coadministration with A779 or PD123319, whereas that on tumor angiogenesis was completely reversed by A779 but not PD123319. These results suggest that similar to Ang-II, which has two receptors, Ang-(1-7) exerts its antitumor effects via both MasR and AT2R, and different receptor subtypes may mediate different biological effects. One recent study showed that Ang-(1-7) may act via both AT2R and MasR because both PD123319 and A779 abrogated Ang-(1-7)-induced vasoprotection (15), which lends support to our results. 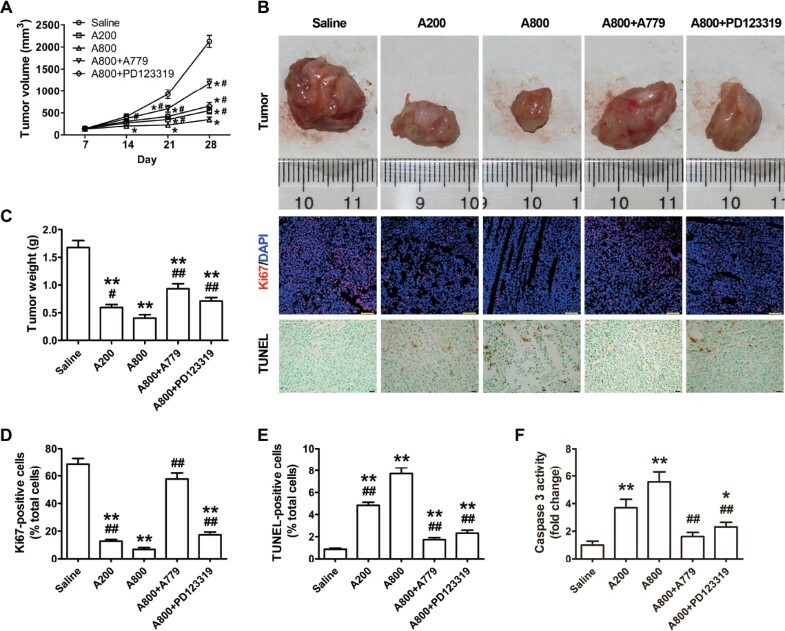 Our results demonstrated that Ang-(1-7) inhibited tumor proliferation in murine hepatocellular carcinoma in vivo and in vitro by directly affecting tumor cells and by indirectly modulating angiogenesis via suppressing tumor cell-endothelial cell communication. Ang-(1-7) was generally thought to inhibit the proliferation of some cell types, including tumor cells, vascular smooth muscle cells and cultured neonatal cardiac myocytes (16,17); but in some other cell types, such as fibroblasts, epidermal stem cells, keratinocytes and hematopoietic progenitors, Ang-(1-7) stimulates cell proliferation (18,19). Thus, whether Ang-(1-7) is an antiproliferative or proproliferative agent for particular tumors or host cells may be an important consideration for understanding the role of RAS in the carcinogenic process and the application of RAS blockade in anticancer therapy. Our results indicated that Ang-(1-7) arrested the proliferation of tumor cells by downregulating AT1R and upregulating AT2R and MasR. Overexpression of AT1R has been demonstrated in a variety of tumors in vitro and in vivo, such as hepatocellular carcinoma and breast and ovarian cancer (7,20,21). AT1R induces tumor cell proliferation by two main intracellular mechanisms: AT1R activates phosphatidylinositol, utilizes two main second messengers, triphosphoinositol and diacylglycerol and causes an increase in cytosolic Ca2+ content, a process linked to mitogenesis in several cell types (22); and AT1R modulates the activity of protein tyrosine kinases, which are coupled to the receptors of several growth factors and are involved in the transduction of growth-inducing signals. In addition, PI3K/Akt signaling and epithelial growth factor receptor transactivation are involved in the regulation of AT1R-induced tumor cell proliferation (23,24). AT2R counteracts the effects of AT1R and exerts antiproliferative action by reducing S-phase cells and increasing G1-phase cells via suppression of CDK4 and cyclinD1 expression (25). AT2R also stimulates the activity of phosphotyrosine phosphatases (PTPs), which have been implicated in cell growth and differentiation (26). PTPs are increasingly viewed as integral components of signal transduction cascades in regulating the phosphorylation state of numerous important signaling molecules, such as the mitogen-activated protein kinase (MAPK) family. Moreover, Ang-(1-7) exerts its antimitogenic effect by inhibiting the activities of proinflammatory prostaglandin cyclooxygenase 2 (COX-2) and MAPK (27,28). 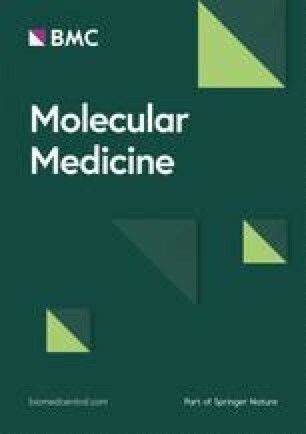 This study demonstrated that Ang-(1-7) treatment accelerated apoptosis of tumor cells, which might be attributed to the downregulation of AT1R and upregulation of AT2R and MasR. AT1R in tumor cells enhances prosurvival signaling via at least two distinct pathways: via activation of nuclear factor-KB and subsequent expression of the antiapoptotic molecules BCL and survivin and via the PI3K-Akt pathway and subsequent suppression of caspases (1). By contrast, signaling though AT2R is linked to the promotion of apoptosis. In prostate cancer cells, AT2R overexpression induced apoptosis independently of Ang II but depended on p38-MAPK, caspase 3 and caspase 8 and was mediated via an extrinsic cell death-signaling pathway that partially depended on P53 activation (29). Consistent with this, AT2R overexpression in hepatocellular carcinoma cells also induced apoptosis, which was associated with a significant increase in caspase 3 activity and p38 phosphorylation (25). As noted above, Ang-(1-7) might promote tumor cell apoptosis by disrupting the stoichiometry of the AT1R and AT2R and subsequently altering their signaling. Our results showed that the proportion of apoptotic H22 cells differed in vivo and in vitro. Microenvironment cells and their soluble mediators play important regulatory roles in solid tumor apoptosis. Tumor cells are directly attacked by cytokine T cells, natural killer cells and macrophages and indirectly regulated by mesenchymal stem cells, inducing apoptosis (30,31). By contrast, both regulatory T cells and myeloid-derived suppressor cells inhibit tumor cell apoptosis (30,32). Moreover, in malignant tumors, the rate of apoptosis is high in undervascularized areas (33). One explanation for these findings might be that hypoxia and concomitant acidosis in the tumor microenvironment induces tumor cell apoptosis (34). Novel therapeutic strategies that emerge are designed to change the protumor microenvironment to one favoring acute responses and potent antitumor activity. Although the roles of Ang-(1-7) in the cell cycle and cell senescence are unclear, ACE2 was confirmed to upregulate the proportion of cells in the G0/G1 phase in A549 lung cancer cells and induce cell senescence of hepatocellular carcinoma (35,36). The development of some antiangiogenic drugs, such as bevacizumab, was based on the principle that tumor growth depends on angiogenesis and that inhibiting this process might be a new strategy for cancer therapy (37). In our study, Ang-(1-7) treatment reduced intratumoral vessel density, decreased the expression of VEGF-A mRNA and protein in tumor tissues and H22 cells and inhibited capillary-like tubule formation of endothelial cells pretreated with H22 medium, which suggests that Ang-(1-7) has antiangiogenic activity in murine hepatocellular carcinoma, which was consistent with results from other preclinical models (5,38). Ang-(1-7) exerts its antiangiogenic effect by suppressing angiogenic hormones, especially VEGF-A (5). VEGF-A plays an important role in the process of angiogenesis (39). It promotes angiogenesis by inducing proliferation and migration of endothelial cells and stimulating vascular permeability (40). 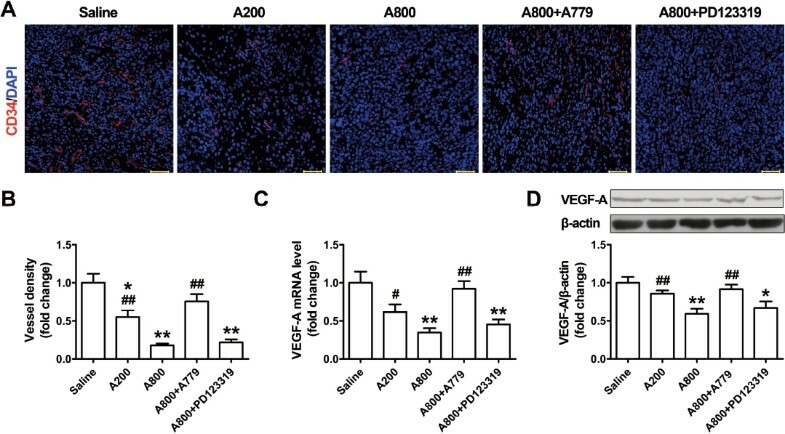 Furthermore, Ang-(1-7) attenuates tumor angiogenesis with a significant increase in soluble fraction of VEGF receptor (sFlt-1) and a concomitant decrease in VEGF receptor (VEGFR)-1 and VEGFR-2. sFlt-1 acts as a decoy receptor for VEGF-A, so the binding of VEGF-A to VEGFR-1 and VEGFR-2 is unavailable, thus preventing the activation of VEGF-A-mediated proangiogenic signaling (41,42). The precise molecular mechanism for the Ang-(1-7)-mediated decrease in VEGF-A is under investigation. Given that the VEGF-A mRNA level was also decreased, Ang-(1-7) may activate signaling pathways to inhibit VEGF-A transcription. The VEGF-A promoter can be regulated by hypoxia inducible factor-1α (HIF-1α), and activation of HIF-1α by MAPK induces VEGF-A expression (43,44). In addition, activation of extracellular signal-regulated kinase 1/2 (ERK1/2) promotes proliferation and inhibits apoptosis of endothelial cells and promotes VEGF-A expression by stimulating the activator protein-2/Sp-1 complex on the VEGF-A promoter (44). In addition, Ang-(1-7) inhibits ERK1/2 activity (28,45). Thus, Ang-(1-7) might reduce VEGF-A expression by inhibition of MAPK signaling. HIF-1α increases VEGF-A expression and also upregulates other proangiogenic factors, such as placental growth factor (PIGF) (46). Ang-(1-7) has been confirmed to reduce the expression of the HIF-1α gene (47), which suggests that HIF-1α may be a key mediator of Ang-(1-7) in regulating angiogenesis. Ang-(1-7) causes reduced PIGF level (44), which may also provide feedback to regulate HIF-1α expression and function (48). The angiogenic and tumor-promoting activity of PIGF remains controversial (49,50). PIGF might positively and negatively modulate tumor growth, angiogenesis and vascular remodeling via VEGF-dependent spatiotemporal mechanisms, which might provide pivotal information for understanding the dual roles of PIGF in modulating angiogenesis and tumor growth and guiding PIGF-based cancer therapy (51). Reduced COX-2 mRNA and protein levels may also contribute to the antiangiogenic activity of Ang-(1-7) (27). COX-2 is involved in tumor angiogenesis (52). Overexpression of COX-2 is associated with the initiation of tumor angiogenesis via the production of both prostaglandins and endothelial cell growth factors, which stimulate VEGF-A to promote angiogenesis, and COX-2 inhibitors block this process (53,54). COX-2 also promotes tumor angiogenesis and tumor invasion via the expression and secretion of the matrix metalloproteinase (MMP)-2 and MMP-9 (55). AT1R induces tumor angiogenesis with an increased expression in VEGF-A (56). AT1R-mediated proangiogenic effect can be triggered by HIF-1α (57). Deficiency or blockade of AT2R-inhibited tumor angiogenesis by impairing VEGF expression in murine fibrosarcoma and Lewis lung carcinoma (58). Whether AT2R activation exerts beneficial or detrimental effects on tumor angiogenesis needs further studies. 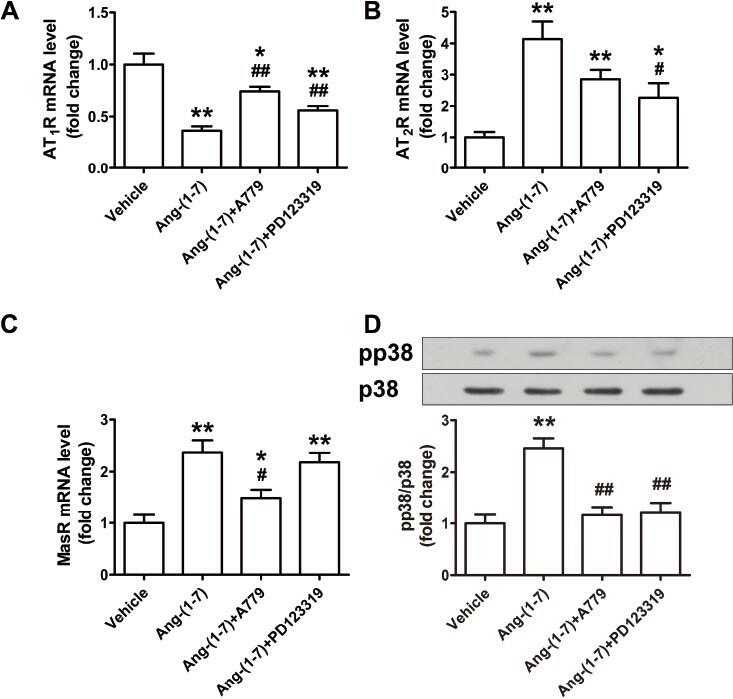 Ang-(1-7) has been involved in angiogenesis with paradoxical effects in a tissue-dependent manner: in human prostate cancer xenografts, it reduced proliferation and angiogenesis by decreasing the levels of the angiogenic factors PIGF and VEGF (41); in rodent models, Ang-(1-7) promoted angiogenesis by stimulating the expression of cardiac VEGF-D and MMP-9, thus facilitating cardiac repair and ventricular function (59). Ang-(1-7) may be used as cancer treatment or even to treat myocardial infarction. Further studies are required to elucidate its exact mechanism of action under different circumstances. Systemic administration of antiangiogenic drugs that target components of the VEGF-A signal transduction pathway has become a viable therapeutic option for patients with various types of cancer. Nevertheless, these drugs can drive alterations in healthy vasculature, which in turn are associated with adverse effects in healthy tissues (60). In addition, the effect of tumor size on vascular density remains controversial. Ng et al. reported that vessel density was inversely correlated with tumor size (61); however, Choi et al. reported opposite results (62). Studies have demonstrated that RAS is involved in several aspects of tumor progression, including proliferative signaling, evading growth suppressors, resisting cell death, inducing angiogenesis, reprogramming of energy metabolism, inflammation, cell migration, invasion and metastasis. Drugs that target the RAS could benefit cancer patients. ACE inhibitors and AT1R blockers, antihypertensive drugs with few side effects and relatively low costs, could be good coadjuvants for cancer (1). Our results indicated that Ang-(1-7) may add a powerful armament to AT1R blockers or ACE inhibitors for the treatment of cancer. Ang-(1-7) treatment suppresses hepatocellular carcinoma via multiple mechanisms involving arresting tumor proliferation, promoting tumor apoptosis, inhibiting tumor angiogenesis and complex interactions of MasR, AT2R and AT1R. Thus, Ang-(1-7) administration may provide a novel and promising approach to the treatment of hepatocellular carcinoma. This work was supported by the National 973 Basic Research Program of China (grants 2011CB503906, 2012CB518603), the National High-Tech Research and Development Program of China (grant 2012AA02A510), the Program of Introducing Talents of Discipline to Universities (grant B07035), the State Program of National Natural Science Foundation of China for Innovative Research Group (grant 81021001), the National Natural Science Foundation of China (grants 81400284, 81371548, 81320108004, 61331001) and the Natural Science Foundation of Shandong Province (grants ZR2014HM044, ZR2014HP045).